Chef Kevin Sbraga just opened his first restaurant Sbraga last weekend following a summer of anticipation among the Top Chef winner's fans and the Philly food community. We actually never watched that season of the reality show, but grabbed one of the last available seats on Open Table this past Friday night to see what the buzz was all about. It turned out to be one heck of a good meal. 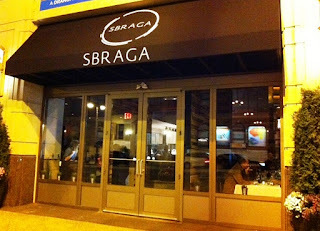 Sbraga requires all seated patrons to choose from a $45/person prix fixe menu - four courses with six options each. First course appetizers, second fish, third meat, fourth dessert. The same items are available a la carte to customers sitting at the traditional bar and the kitchen bar. 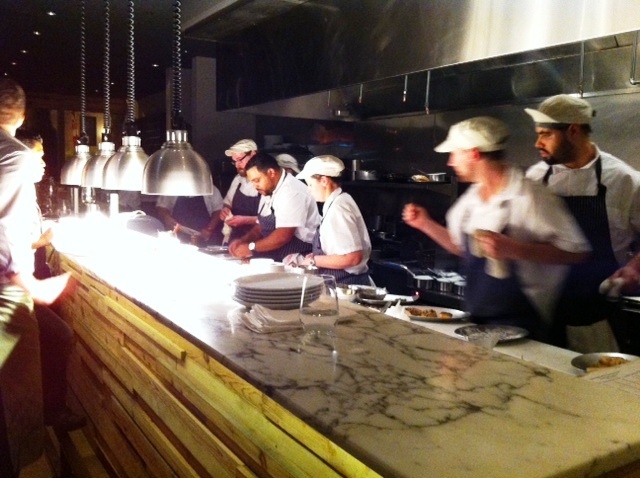 We are big fans of watching chefs cook from a kitchen bar, but glad we sat down for the four course dinner at Sbraga. Unless you really don't want dessert, we agreed that diners should just go for the full experience. The portions are small, so getting just an appetizer and an entree may leave you hungry an hour later. We did the math and ordering our same four individual items works out just under $45 for me, and just over $45 for Bradd, anyway. The winning dishes for us were the foie gras soup and the lamb belly with broccoli and sesame granola. 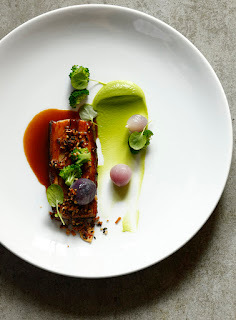 To make the lamb belly, Sbraga alternates lamb breast with fat in thin layers, cooked to perfection and served with the crunchy granola on top. 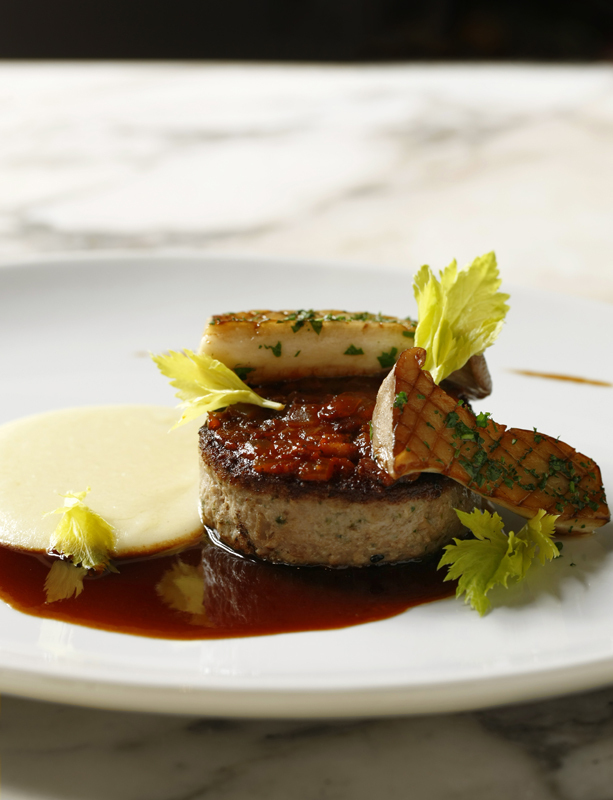 It results in a striking combination of flavors and textures. Sort of like pork belly, but meatier and possibly more gratifying. I wish we asked what goes into the foie gras soup broth because it was just divine. Distinct from any flavor we've had before. Literally stops you mid-slurp to ponder about how unique it is. The bacon marmalade atop the meatloaf with potato puree really made that dish memorable, too, though the portion was smaller than the circumference of an average coffee mug. (I have one in my hand right now, thus the comparison!) It would have been nice to have a little more meat and potatoes, since it was the third course and very tasty. The clams were also quite good, particularly the accompanying fennel sauce. If Sbraga offered baskets of bread there is no doubt every last drop of that sauce would have been gone. Though at the beginning of the meal you get a warm, flaky homemade popover, so consider asking for seconds. The clams come with orecchiette, which was a good in concept however my pasta came undercooked. It was the only food-related slip of the night but I got over it because I needed every bite of chewy pasta to soak up the sauce. 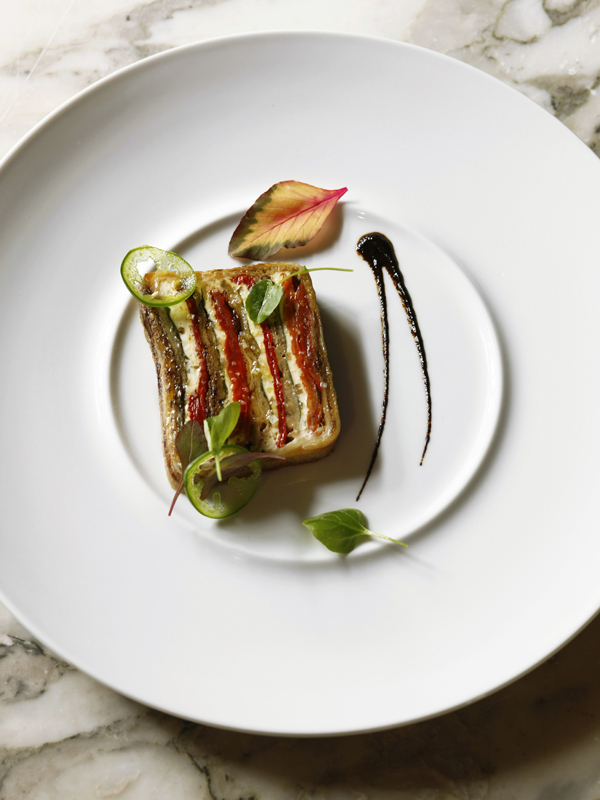 The Eggplant Terrine is a good choice for the first course. Sbraga layers eggplant, goat cheese and roasted tomato in a way that tastes great on its own, without the black garlic you see off to the side in this photo. I love garlic, but didn't care much for the black garlic here. Bradd tried the Fish and Chips for his second course. He really enjoyed its light flaky batter and the cauliflower remoulade. Desserts at Sbraga are all made by Chef Sbraga's wife, Jesmary. The Hot Chocolate hit the spot, offering a warm moist chocolate cake and butter pecan ice cream. I could do without the cranberries at the bottom though - adding ice cream is cool, but otherwise I like to leave my chocolate as is. Bradd enjoyed the mascarpone with coffee granita. A key tip, both for Sbraga and future diners: the menu needs some clarification. Ask your waiter to describe dishes that appeal to you because, for example, the menu doesn't say there's goat cheese in the eggplant so if you don't like or can't eat goat cheese, you wouldn't know. Also, the chicken entree is fried, which did NOT please a lady at a table near us. The dessert listings are more like ingredient lists, too. I like a little mystery, but it was helpful to ask for a few details before ordering. Since it was the first week, I'll give Sbraga a break on some service kinks. It took while to even order drinks, let alone dinner. We were happily surprised, though, to realize our full meal lasted nearly two hours. They brought the food out at a good pace and didn't chase us out even though the bar was packed with people waiting to sit. The tables, however, are way too big - at least those along the windows. Bradd and I felt like we were a mile apart and had to speak loudly to make up for it. Others around us commented on the distance immediately upon sitting down, too. The restaurant is not that big, and traffic jams were quite common in the aisles. They'd be well served to chop off about 8 inches from each table. Chef Sbraga at work in the kitchen (center, without a hat). I took this one! For the average diner, Sbraga's prix fixe menu is great for a nice night out. It's not ideal for large groups, children or if you're looking for a modestly priced, hefty dinner. If you're in the mood for a smaller well-executed meal, before the theatre perhaps, hit up the kitchen bar and pick two items off the a la carte menu. I warn you now it will be a tough choice! Great review. I did watch the top chef season he won and I was really looking forward to this place. Seems they have a few kinks to iron out and I read an interview where he said the menu will change soon, so I'll wait a few weeks and then head down, but I am looking forward to dining there. Great, honest review. I'm dying to try that foie gras soup!